Since I had so much fun doing The Reader Problems Tag, I saw this one on LiamsLibrary and I couldn’t resist – I’ve decided to drop a tag at random, once a month. Bookish questions, take two. 1. What percentage of books do you get from the library and what percentage do you get elsewhere? 0%, 100%. I know, sue me. I used to use the library avidly when I was younger (I’d go at least once a month and withdraw up to 10 books at a time) but with the Internet playing such a prolific role (books being so cheap and quickly delivered) the library is somewhat superfluous to my requirements. I would definitely take my children to the library should that day come, but personally for me, buying my own books works better for me. 2. What character would you want to be and why? Ever since I was seven years old I envisaged myself as Hermione Granger, from Harry Potter. She was everything I was, indeed I am, so if I could be myself (as her) at Hogwarts, I think that would be pretty amazing. Alternatively, I’d love to be as brave as Katniss Everdeen, from The Hunger Games – although I’m not sure I’d want to have to compete. 3. What is your favourite childhood book? Harry Potter. I began reading the series when I was seven years old – I was the first of my friends to begin reading the novels – and fourteen years later, my love for Harry is stronger than ever. Before the worldwide phenomena hit, I was a big fan of Enid Blyton’s Faraway Tree stories, as well as Jacqueline Wilson books. If I was forced to narrow down my favourite books and pick only one, I think I’d have to go with “Harry Potter and the Goblet of Fire”. That’s where the series really came to life for me (aged eight or nine). It’s an action packed fantasy, which retains its childlike roots, whilst simultaneously progressing to more adult content. Other favourites include “The Hunger Games” and “The Cuckoo’s Calling”. 5. Which book series do you have the most books of? Has there ever been a more appropriate question? The answer, unsurprisingly, is Harry Potter. The number of Harry Potter books I own stands at around 100. I own several different editions, prints and bind-ups, and my collection is only growing! 6. Do you buy used books? Rarely. If it’s a book I want that I am unable to source in a new condition, I do purchase the occasional used book from Amazon/eBay/AbeBooks. I generally avoid used books though as I am not a fan of someone else having handled them (OCD). That being said, if I manage to locate a rare used copy of a book, I’m the first to snap it up! 7. What is your favourite book cover? 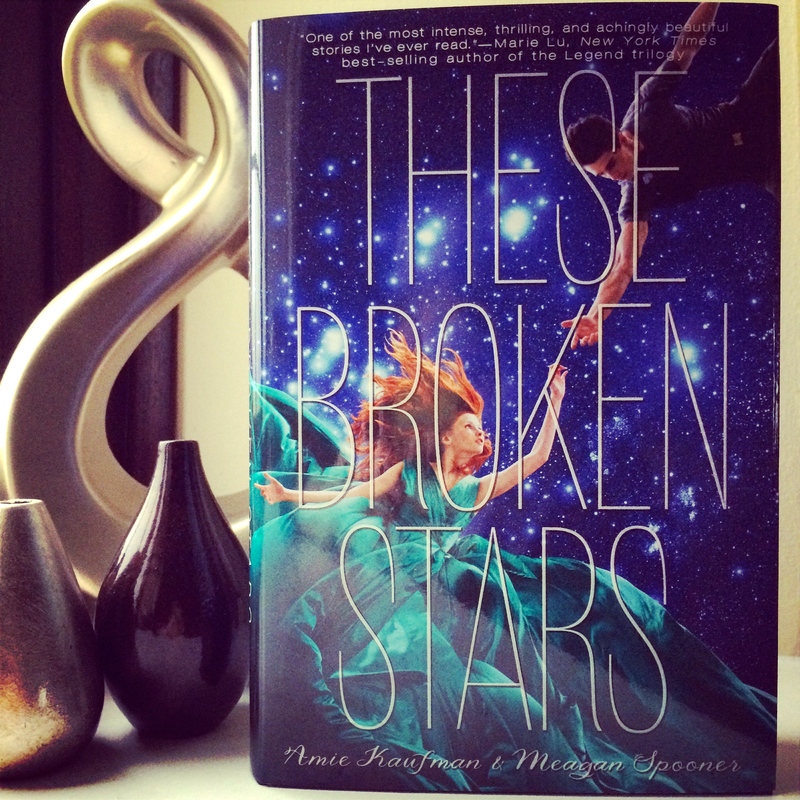 It is rare that I purchase a book solely on the cover, but the recent exception was my purchase of “These Broken Stars” by Amie Kaufman and Meagan Spooner, which is absolutely gorgeous. I have grasped the premise since purchase, as it has been receiving some positive reviews on Goodreads, but it is just an absolutely phenomenal cover! 8. What is your favourite type of book covers? Ones that remain the same style for the entire series. I do confess to judging a book by its cover on a regular basis. I tend to hate covers with photos of people, especially when it’s just one person staring out at you – that really puts me off a book. I feel that a cover can drastically enhance my perspective of a book and an author, and is definitely a deciding factor in whether or not I purchase a particular book – bad I know. 9. What was the first book you read? Interesting story: I don’t remember learning to read. I was taught to read at such a young age that I have absolutely no recollection of the process of learning. On my first day of school when I was five, my teacher handed me a “Biff and Chip” book to read aloud to her. I’d never heard of Biff and Chip (which are books children in the UK work their way through when learning to read) and the book was so easy that I thought the children must be rather unintelligent. I read it aloud in a somewhat stunted manner, because I didn’t want to be left out on my first day of school, but thankfully my teacher realised that I was far above the Biff and Chip reading level, so I skipped the entire years reading list, and progressed straight onto a non-fiction book about shire horses. 10. What is your favourite book to movie adaptation? I’m going to be highly controversial, and say one of the ‘Twilight Saga’ books. As I’ve yet to read ‘Breaking Dawn’ (despite them probably being my favourite two films), I’m going to say ‘New Moon’. It really was a great adaption, as it was very true to the book! I’m a stickler for details, but I loved both the book and the film. 11. When did you start blogging? I started blogging in August 2012, just a few days before my A Level results were released. As such my blog post was called A Level Stress. It wasn’t bad for a first attempt – I’ll excuse my few grammar errors: I was nervous about my results! As soon as I started, it sort of spiralled out of control, and here we are! 12. Where is the best place to read? 13. Have you written your own fan fiction or a book? No. I hate fan fiction. I seriously do not get the point of it. A novel is a novel, and characters are characters for a reason. Technically, fan fiction is plagiarising anyway. As for my own book, I have several novel plans on my laptop, as well as the first few chapters of a couple of the ideas that could well be turned into books – if I had the time or energy that is! Simple answer, I’d love to have a book published! 14. If you could only read three books for the rest of your life what would they be? Bit harsh. If we are literally talking about three books (not three series), I’d choose “Harry Potter and the Goblet of Fire” by J.K. Rowling, “Noughts and Crosses” by Malorie Blackman and “The Time Traveler’s Wife” by Audrey Niffenegger. I think that covers all bases quite well. 15. What is the longest book that you have read? I believe it would be George R.R. Martin’s “A Clash of Kings” which I finished in March of this year. Standing at a whopping 911 pages, it outstrips “A Game of Thrones” 780 pages and the 766 pages of “Harry Potter and the Order of the Phoenix” by quite a considerable number. 16. If you were to write a book what would the title be and why? The book that I have the most defined plot for is a dystopian thriller. Maybe “Foresight”? Or “Premonition?” Or perhaps they’re too obvious? “Jumper?” However, if I were to write an autobiography, I’d probably call it “The Life and Lies of the Lucky One” – references to two of my loves, ‘Harry Potter’ and Taylor Swift. 17. How many books did you read last month? In March I read six books: “This Book Is Gay” by James Dawson, “Insurgent” by Veronica Roth, “A Clash of Kings” by George R.R. Martin, “Eclipse” by Stephenie Meyer, “Point Blanc” by Anthony Horowitz and “The Princess Diaries” by Meg Cabot. My favourite was “Eclipse”. 18. What is the last book you read? The last book I read was “Throne of Glass” by Sarah J. Maas, which was my 25th finished book of 2015. I thoroughly enjoyed it, and am now reading the second in the series, “Crown of Midnight”. 19. Do you fantasise yourself in books you like? Rarely. I tend to read as though I am an outsider looking into the world (the exception is some 1st person written books, which when excellently executed, I can imagine myself being a part of the story). I tend to prefer to not fantasise myself in books I like – for example, I love “The Hunger Games” but why on earth would I want to be there?! 20. What is your favourite book store? Waterstones is my go-to bookstore, partly because it’s the best bookstore in my town, and partly because I know what to expect from every Waterstones nationwide. I love online shopping on Amazon, Foyles, TheBookPeople and Goldsboro Books as well. Hardback. They are more durable than paperbacks, and they look better when they are on the shelves. The only niggle I have with hardbacks (other than their inflated price) is that the heights vary more than paperbacks, and since I like my shelves to look neat, different sized books can prove problematic. Having said that, paperbacks have their place too – I own probably three times as many paperbacks, and they are cheaper and more practical. 22. Do you have more than one copy of the same book? Yes, a dozen times over. Actually, more than a dozen times over. I believe my most owned book is “Harry Potter and the Philosopher’s Stone”, of which (at last count) I have 17 copies! Yes, I realise how ridiculous that sounds. I have multiple copies of all J.K. Rowling/Robert Galbraith books, The Hunger Games trilogy, and a few books that I have signed copies of, as well as unsigned copies. I know there are more, but I’m not prepared to write an essay, and I know you’re not prepared to read it. 23. Would you rather read about vampires or werewolves? 24. Do you own more than 150 books? I wish I knew how many books are in my possession. I’d guess I’m fast approaching 1,000 now, if I’m not there already! I’m in desperate need of my own personal library – I’ve certainly got the books to make a good start at filling it. If you stumbled across this blog post, consider yourself tagged. Make sure to let me know of your answers, I love reading them! I love how Harry Potter was your answer to a lot of questions, it’s so true! And you’ve got me in the mood for peppermint tea now haha! Taylor Swift is perfection ❤ Great post!